Mordenkainen’s Tome of Foes is an epic fantasy supplement for Dungeons & Dragons, written and published by Wizards of the Coast. 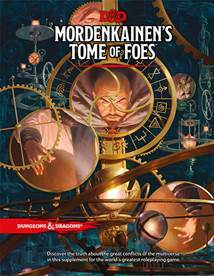 Mordenkainen’s Tome of Foes is a two-part review. Part 1 looks at the supplement from a player’s perspective; part 2 looks at the supplement from a DM’s perspective. This is part 1, a player’s perspective of Mordenkainen’s Tome of Foes. Mordenkainen’s Tome of Foes is essentially two books in one; the first half is a sourcebook detailing the ins and outs of some common races within the Dungeons & Dragons multiverse. The second half is a bestiary. Being that this is a review from the player’s perspective, the bestiary half of the book will not be reviewed other than to note there are lots of adversaries that tie to the source material. The review of that material will be found in part 2 from the DM’s perspective. The sourcebook portion of Mordenkainen’s Tome of Foes delves into the finer details of: The Blood War, Elves, Dwarves and Duergar, Gith, and Halflings and Gnomes. Interestingly enough, the book sells this source material as “material for a Dungeon Master to add depth to a campaign…” But in all honesty, it goes way deeper than that and provides a ton of material that can be used for character creation. Let’s take each subject matter individually. The Blood War details the endless war between demons and devils that plays across the Lower Planes and often forces itself into the Material Plane. On the surface, this doesn’t seem like anything a character can use, but look through the details of each subject and you find a wealth of material. First, it discusses the role of different warrior-types in the war or how those warrior-types are used and abused by the demon lords or lords of the Nine Hells. Second, it details each demon lord and lord of the Nine Hells should one of them be your chosen deity given your choice of alignment. Third, it describes diabolical cults should you choose to play an antihero or chaotic campaign. Finally, it discusses cambions and tieflings if you choose that as your character race. Elves is not just about elves; it goes into the beginnings of elves and how they became divided from their drow brethren. It provides an in-depth look at what makes elves different from drow along with detailing both elven and drow deities. There is lots of source material to color elven character’s background and the inclusion of additional elf subraces – eladrin, sea elf, and shadar-kai. While it may be written to add flavor to a DM’s campaign, all of the content is usable by players. Dwarves and Duergar describes the differences between dwarves and their Underdark brethren duergars including their origins and what deities they follow. Much of the content covers enemies and motivations along with character options for creating duergar PCs. Although duergar deities are listed, due to the size of the dwarven pantheon, very few deities are detailed. The chapter concentrates more on what motivates these folk. Gith and Their Endless War goes through the ins and outs of the githyanki and githzerai. It provides a detailed look at what sets the two apart and common tropes for each gith subrace. The content focuses more on gith locations, possessions, and the like along with providing PC options for both githyanki and githzerai. Halflings and Gnomes is not quite like the first four chapters. There is no rift between the two races, but rather parallel interests in what motivates them to become adventurers. This is excellent source material for PCs as it defines “What makes a halfling/gnome adventurer unique?” Deities for each race are detailed within along with a wealth of motivating factors for becoming an adventurer. It also provides the PC options for deep gnomes (svirfneblin). If you really like delving into the details of your character’s backstory, this is a great book to get with plenty of source material. DMs will obviously find a wealth of information for detailing various locations in their games and filling them with adversaries, but players will not be let down. The only drawback is that you can only use less than half the book because the rest is bestiary, but it’s an amazing five chapters; especially if you love the fluff behind the Dungeons & Dragons multiverse!